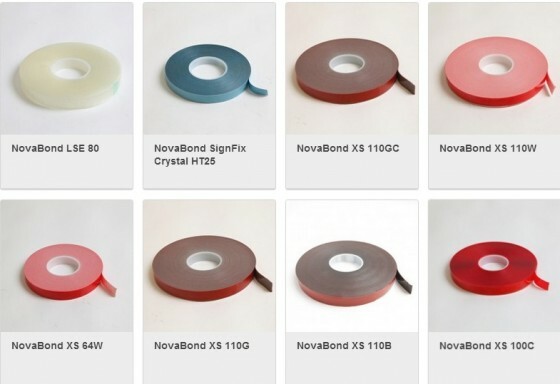 1) NovaBond High Strength Bonding Tapes offer unrivalled peel, shear and tensile strength. 2) NovaBond is cleaner, faster and easier to use than mechanical fixings or liquid adhesive / sealants. 3) NovaBond amortises the load equally along the bond line eliminating stress points created with mechanical fixings such as rivets, bolts and screws when under high loads and strong winds. 4) NovaBond is a non-curing, visco-elastic adhesive mass which remains flexible in service. This allows a high degree of expansion and contraction between differing substrates at extremes of temperature and improves elastic recovery under dynamic stress loads and impacts. 5) NovaBond, being of a foamed or extruded acrylic construction, prevents galvanic corrosion between dissimilar metals, provides acoustic dampening and accommodates vibration whilst sealing against moisture and insulating against cold air. Click on the image above to link directly to the product page or contact Michael Thompson @ michael@innovasolutions.co.uk for more information.